This week’s movies are Looper and Ruby Sparks. They’re both still currently in cinemas, so catch them if you can! I love a good time travel story. In Looper, time travel is invented in 2074, but only criminals use it to send people they want disappeared back into the past, where they get killed and disposed of by “loopers”. Loopers get payed a lot, but eventually have to “close the loop”: kill their future selves. When Joe (Joseph Gordon-Levitt) recognizes his future self (Bruce Willis) as his victim, he hesitates and lets him escape. Looper is one of those sci-fi movies that I’m pretty sure I’ll be able to watch over and over again. It’s got a great story, awesome cast and pretty cinematography visuals. I was expecting it to be a little bit more twisty, even though I’m already struggling with getting the timelines straight in my head. It makes sense… I think… more twistiness would have only complicated it more. I loved the visual style of Looper. In the first half of the movie, they show a gritty, yet stylish picture of the future. 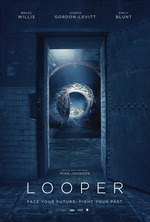 I quite liked that a lot of the future felt grounded in reality; time travel aside, the world of Looper seems plausible. I also like how subtle the use of prosthetics was to make Joseph Gordon-Levitt look like Bruce Willis; it’s only when they were sitting opposite each other that I noticed it. I’m very tempted to see Looper again in the cinema, especially cause the director (Rian Johnson) has released a theatrical commentary track that you can download on Soundcloud. Have you seen Looper yet? What did you think of it? Ruby Sparks is not your typical movie. It’s also not easy to pinpoint which genre it is. It’s part romantic comedy, part drama, with a pinch of fantasy. If I had to compare it to something, think Stranger Than Fiction meets 500 Days of Summer. I loved Ruby Sparks. It’s a unique combination of romance and weirdness. Calvin creates this girl who should be perfect for him, but then notices all these little flaws and realizes he has the power to change her. Ruby is his creation. It takes the concept of being able to change something about the person you’re dating to a whole other level. What would you do if you had that type of power? I also liked how it didn’t try to explain how and why everything was happening. I think it would have felt cheesy very quickly if they did, and it didn’t feel as if the movie needed it. I like how it all remained unexplainable and yet acceptable. Both Looper and Ruby Sparks are currently in cinemas. Will you go see them? Have you seen them yet? Let me know below in the comments what you thought of them!